Earlier this month, I saw a modern blocks quilt along that I wanted to join. Since the discovery of modern quilting patterns on Pinterest is part of what drew me back into quilting, I figured this quilt along would be a great skill builder and a cool way to find some other quilting blogs online. However, I just can’t get into sampler quilts for some reason, so I decided I’d take my blocks and make them into placemats. I didn’t know that it could take so long to make two placemats. Seriously, so. so. long. to make this – the other one still needs binding. But, I did learn some skills (at least sorta) along the way. First, I figured if I was going to be making two placemats, that would be quite a few flying geese units. I decided it would be the perfect time to check out some of the Pinterest tutorials on making multiple flying geese units at once. I found Lily’s tutorial over at Block a Day tremendously helpful because she gives some helpful math formulas to get the right size block. So, I made some using the no waste 4 at a time method, and I made some using the one at a time method on the quilt along post. I wanted to see which way I liked better and the light blue fabric from my stash was too narrow to cut into the squares required for the 4 at a time method. Here’s me chain piecing the geese together. In theory, one side of the block is in place. I was supposed to be able to snip off the excess corners, iron the seam open, and have a nice block. 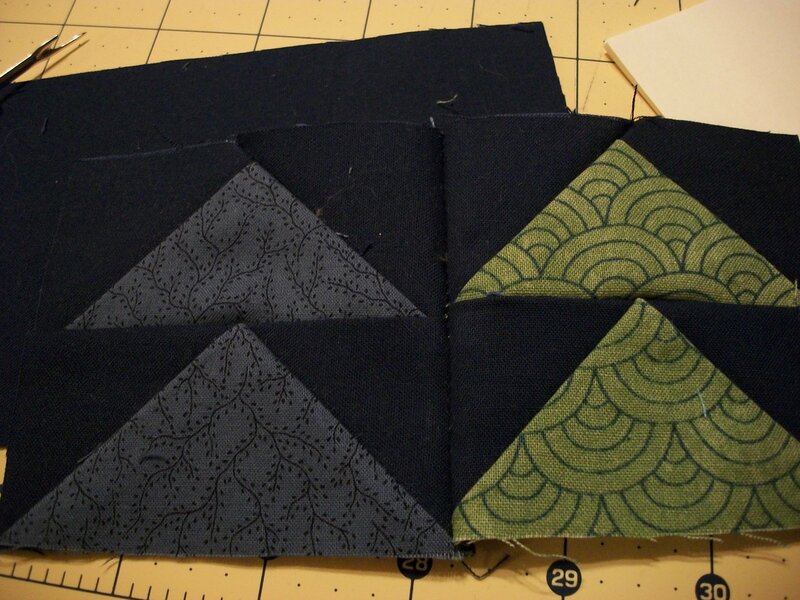 Hm…except I sewed the second dark blue piece to the wrong side of the fabric — 7 times! 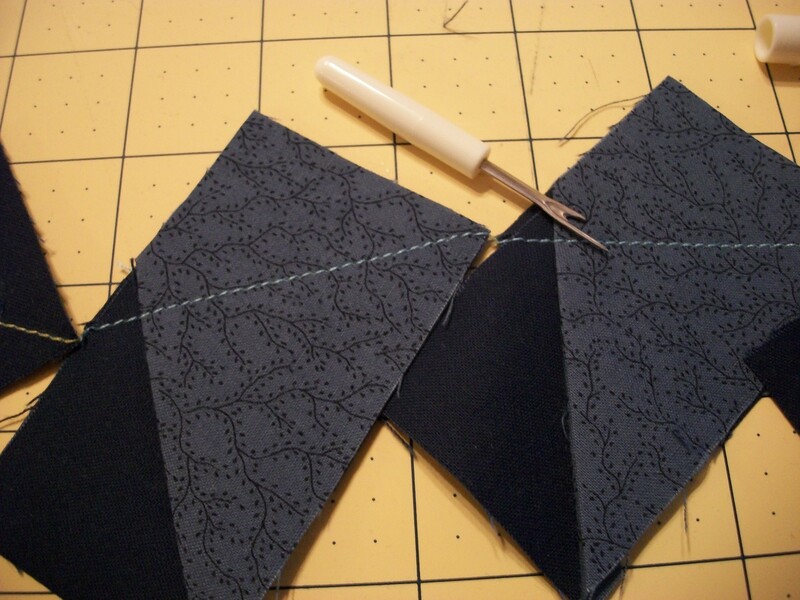 My advice when chain piecing would be to make sure the pieces are going together correctly so you don’t efficiently repeat the same mistake over and over again in quick succession. Note the star of this photo — the seam ripper. Then, in the intervening time, I had a chance to wander over to one of my new favorite blogs – Young House Love. I was sitting on my couch literally laughing out loud as I read Sherry’s post about making those little tea bags off Pinterest with her sewing machine. I almost died as I read about her desire to hulk smash her machine at times and about the way that she normally doesn’t use obscenities, but her sewing machine pushes her to and over the edge on occasion. It was all so hilarious until I was ready to hulk smash Betzee because she kept coughing up thread nests like nobody’s business. 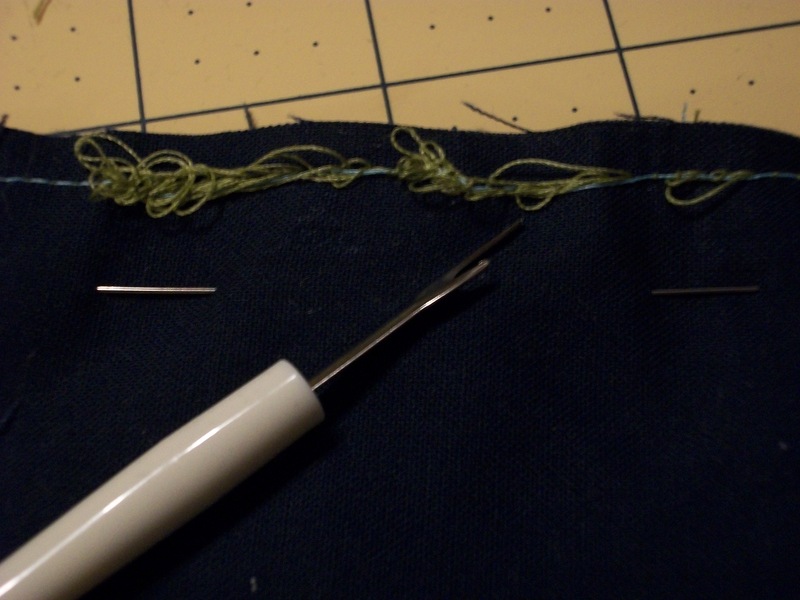 If that seam ripper keeps starring in these posts, I’ll have to give it a name too. Along with the thread nests, I was having trouble getting the points to line up, so it looked a little like geese were racing instead of flying in formation. Egad! During my idealistic phase, I ripped the seams out of this to try to get a better match. My efforts at perfection were rewarded by more thread nests. Before I threw Betzee to the ground in a fit of rage, I tried to search the internet to find out how to get her to sew through the multiple layers of fabric that had built up at the points of the triangles. This devolved into my trying to hold up the presser foot with layers of post-it notes…rather unsuccessfully I’ll add. At one point, I stacked all the pieces up and decided that I would just have to wait until I could see my friend Jennifer to figure out how to make Betzee work. But, once I sink my teeth into something like this, I obsess over figuring it out — as long as I don’t give in to abject despair. So, I went back to Google again. Seriously, quilting and sewing forums and Youtube are my best friends in this endeavor of learning how to quilt. If I had lived in the pre-Google days of Laura Ingalls and had been responsible for sewing everything I owned, then I’d most likely have had a book series called The Naked Pioneer. It probably would not have been as kid appropriate at Little House on the Prairie. 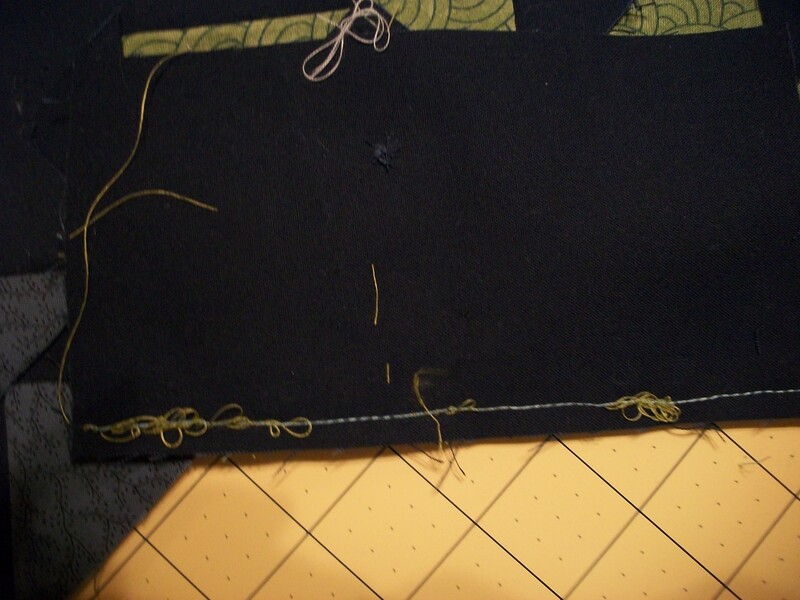 Finally, I figured out that if I put my walking foot onto my machine, I could get over the thick seams. I was sad to give up my 1/4 inch foot since I was already having trouble getting accurate points, but more thread nests were going to drive me to the edge of my sanity. I think I’m going to need to resurrect some old school expressions of consternation like “Golly!” or “Heavens to Betsy!” or “Jeepers!” If I don’t, I might be cussing like a sailor by the time I get my Etsy quilt shop launched. But, the walking foot worked. I got the placemats pieced, and then I found out why everyone says that straight line quilting takes a long time because that’s how I quilted the placemats. And, for my final skill learned, I wanted to be able to practice binding the quilt by pulling the fabric from the back. I was trimming away the batting and was coming down the last line of batting to trim when I did it. 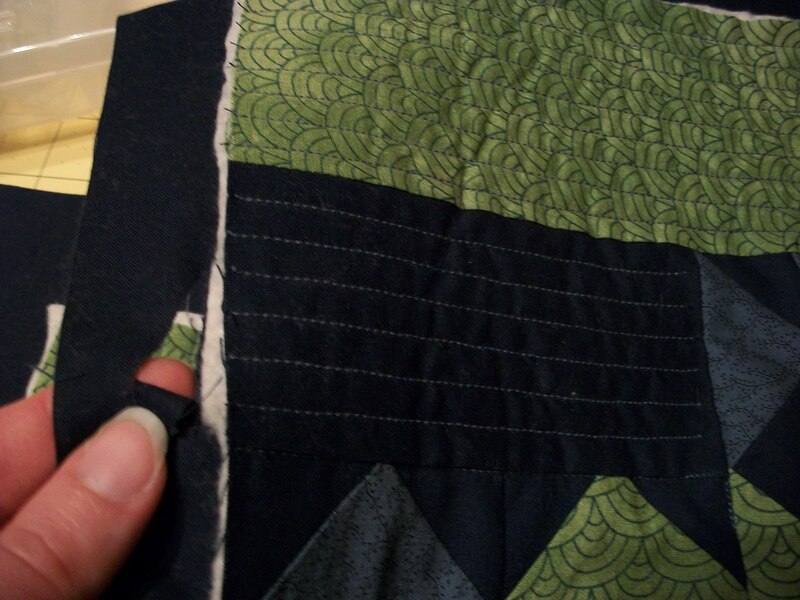 I slashed right through the backing fabric right up to the edge of the quilt. So much for pulling the backing over. So, I spent tonight hand binding since I was having a hard time catching both sides of the narrow binding on my machine. At the end of the day, I like the colors that I put together. And, I did what I set out to do. I sorta have some new skills under my belt…or at least, I know what to avoid in the future. Sure, I might have some adolescent geese on the placemat that are a tad bit smaller than the rest, and I wish I hadn’t clipped so many wings (ie. all those missing triangle points), so I’ll need to continue to improve. But, after a little more binding, I will have two handcrafted placemats, and someone can enjoy that they were not manufactured in a factory but were pieced one little piece at a time with a lot of time and attention — and an expansion of my consternation related vocabulary. I too am attempting the modern block quilt along and learning new skills. I love the idea of turning the block into a place mat by adding a block of fabric on the side. Brilliant idea. Love your color choices. 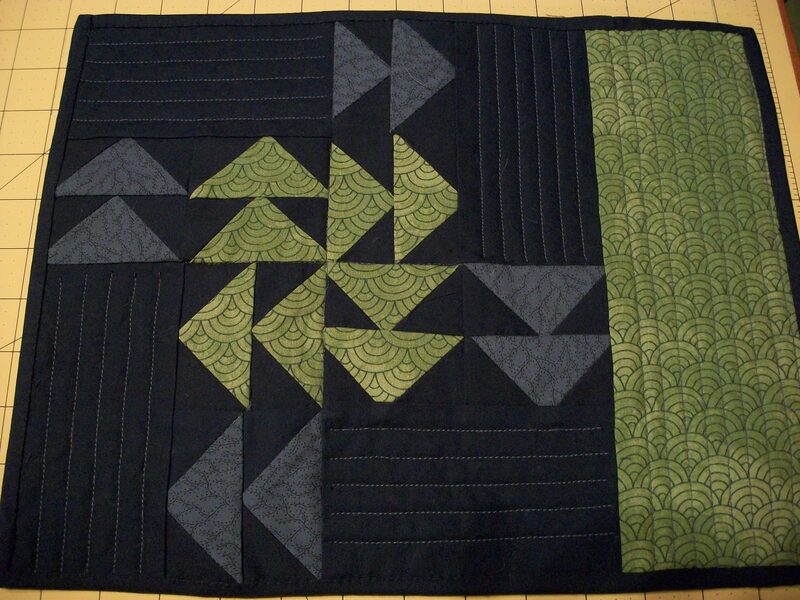 Cindy, is your block #15 on the linky post? If so, it’s great! You definitely didn’t have the clipping of the wings problem that I had 🙂 Such neat, even triangles! Thanks for commenting on my blocks. June is a busy month, so I was super excited to see that June’s modern block looks far simpler than the follow the leader block. I’ve almost got my fabrics all collected for it. “If that seam ripper keeps starring in these posts, I’ll have to give it a name too.” hahahaha. Yes! I feel the same way. I hate flying geese so kuddos to you 🙂 This looks great and I love the straight line quilting! Thanks, Ashley! I’m breathing a sigh of relief that the next block is based on all straight lines. I can do those….famous last words. I’m guessing the seam ripper will be needed before the project is concluded. I love it! I really enjoyed reading your post – it is educational, funny and rings all sorts of bells for me. I am also and English teacher and am in the process of making a quilt for the first time. I like the flying geese. I must try to use them in my next project. You are so brave to sew a king size quilt for your first effort. Congrats that you were able to fit all the pieces together. You were smart to pin them to the sheet to keep them in order while they wait their turn to be pieced into the whole. Well, I knew I would have to roll it all up and put it away while I sew the quilt top. I love how the books all say, “use a design wall, if you have one” but don’t offer any suggestions about what to do if you don’t!